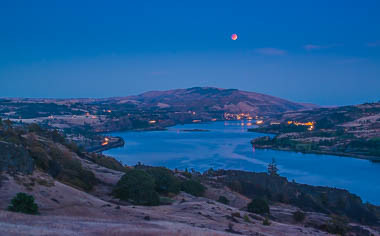 In hopes of capturing some interesting color with the red moon, the hills and view of the Columbia River from Coyote Wall seemed liked a good choice. The weather was ideal. A warm, gentile breeze blew over the dry grass. A few mountain bikers and hikers were in this open and spacious area. There was quite a bit of haze at lower elevations, with the moon slowly revealed itself as it rose in the growing darkness. It was quite a lovely sight. The deepening blues of night with a few stars appearing. 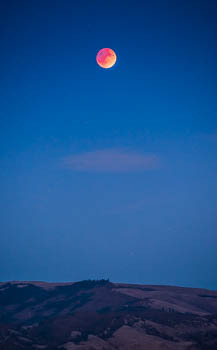 An appealing aspect of these eclipses is, because of the shading, the moon appear to be a nice round ball. The lights of Lyle, Washington added a nice warm shade of lights. 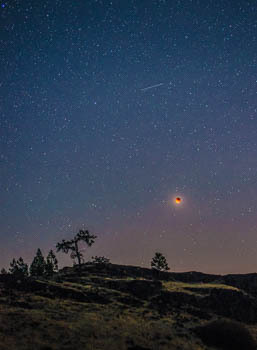 Later, as the shadow of the earth moved away from the moon, the light returned to one side, making a very interesting orb in sky with stars and and meteors.